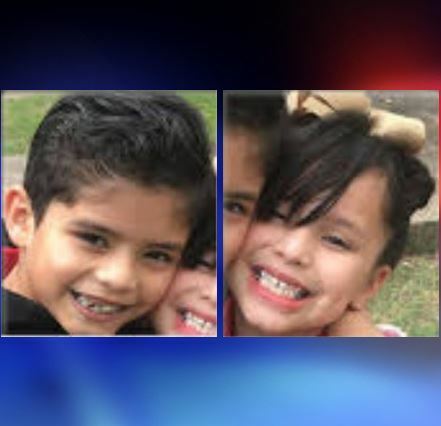 Authorities are searching for two children out of Suwannee County -- 7-year-old Brian Mejias, who was last seen wearing a red shirt and blue jean shorts and 6-year-old Gabriela Mejias, who was last seen wearing a pink dress. Authorities are searching for two children out of Suwannee County — 7-year-old Brian Mejias, who was last seen wearing a red shirt and blue jean shorts and 6-year-old Gabriela Mejias, who was last seen wearing a pink dress. According to the press release, Brian has short hair with a hard part to the left. He has a scar below his hairline on the right side of his forehead and is missing teeth on the top right. Gabriela has long, dark hair past her waist. She has noticeable dimples, and all her teeth are crowned except the front four. They may be traveling in a black Toyota Camry, with dark tinted windows. The vehicle has a Texas license plate and might be driven by a male by the name of Rochie. The children were last seen in the vicinity of the 900 block of Ohio Avenue North in Live Oak. This vehicle is possibly traveling in a caravan of three vehicles. One of the other vehicles is a grey, Chevy Tahoe or Suburban with lightly tinted windows and a Texas license plate. The other possible vehicle is a beige Chevy Tahoe or Suburban with no tint; it is possibly being driven by a male named Melecio and occupied by a female named Alexia. There are possibly 13 people in total plus the two children. If you see these children call the Suwannee County Sheriff’s Office at 386-362-2222, or dial 911.